The singer equals the heights she reached in her 1958 triumph at the Newport Jazz Festival. In this television broadcast there is no audience cheering her on, as at Newport, but O’Day shows that she needs no crowd to generate energy and enthusiasm. She has the backing of her pianist and musical director Bob Corwin and a superb big band of Japanese musicians led by Takao Ishizuka playing Buddy Bregman arrangments. Among the 15 songs, she reprises two of her Newport hits, “Sweet Georgia Brown” and “Tea for Two.” On the latter she jams with three horn players in a riotous exchange of high-speed phrases. This remarkable DVD preserves O’Day’s musicianship, impeccable timing, stage presence and charisma. This is a must have for Anita fans. Thanks for calling attention to it! I have, somewhat belatedly, listened to Anita O’Day’s live recordings from concerts in Stockholm and Oslo (1963 and 1970, respectively). 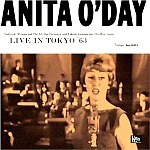 The album is part of the Jazz Icons DVD series and features Anita in prime form. I want to thank Doug for his excellent summary of Anita’s career which accompanied the album.